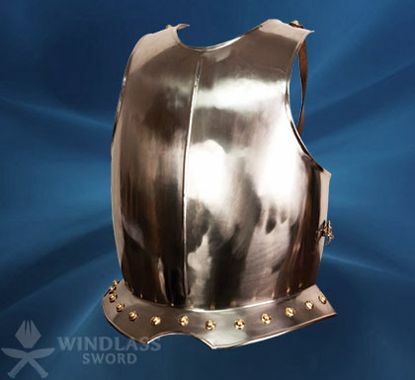 As well as manufacturing swords, Windlass produces Medieval armour, Medieval helmets, Medieval reenactment and the Medieval breastplate which gives the significance of Medieval period. Out extensive range of Medieval armour and medieval helmets includes the full suit of armor, Embossed helmets of Viking & Morion and the Spanish breastplate as a part of Medieval reenactment as well. The 15th century was a bloody one for Europe. The Wars of the Roses, problems in the French monarchy, the constant warfare between the city states of Italy and the final expulsion of the Moors from Spain the whole continent seethed with bloody strife. One result of this constant warfare was the improvement of plate armor to its peak of efficiency. 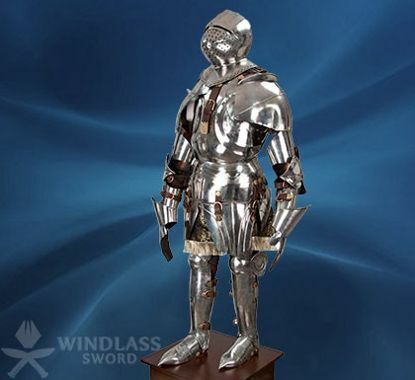 We are pleased and proud to offer a Duke of Burgundy full suit of armor based on a 1450's Italian style. 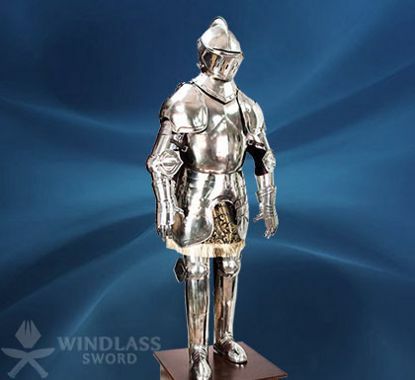 Hand-forged of 18 gauge steel by experienced blacksmiths at Windlass Steelcrafts®, this full suit of armour impressively crafted replica is as stout as the original. This noble and enduring symbol of the knightly age comes partially assembled with a handsome hardwood display pedestal, ready to enhance your own castle entrance. Comes complete with full skeletal body and decorative skirt. This full suit of armour Stands almost a full 7 feet tall! Fully articulated. Large sections of plate armor began to be added to mail during the middle of the 13th century. This continued until full plate armor developed sometime in the late 14th century. Two main centers for the production of armor were Germany and Italy. One of the most beautiful of the styles was that called "Gothic. The Italian Gothic, which we have reproduced, was fuller, not as spiky, but offering a great deal of protection as well as comfort. Offering a rounded surface to both lance and sword, the Italian Gothic armor was in high demand throughout Europe. During this period of time, the average suit of armor would cost about the same as a top of the line Mercedes now. Fortunately our suit doesn't cost anywhere near that! Historically accurate and fully articulated, this is a fine example of the armorer's art. Hand forged by Windlass Steelcrafts® of 18 gauge steel. Complete with full skeletal body and decorative skirt. Leather straps. Comes with wooden pedestal making this piece stand an impressive 7 feet tall! 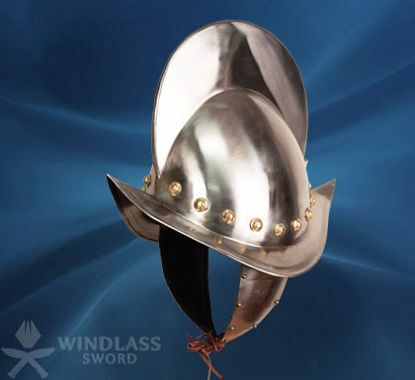 This type of open helmet used from the middle 16th and early 17th centuries. 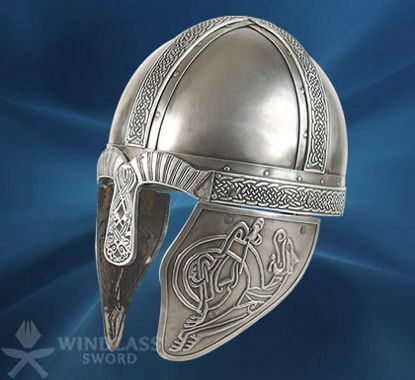 This full metal helm is decorated with brass accents and comes with protective ear flaps, chin strap, plume holder, as well as an adjustable cloth liner. Plume sold separately. Made by Windlass Steelcrafts of 18 gauge steel. This one-piece breastplate was typical of the Spanish armories, but was imported and copied by many other counties of the 16th century and was mainly worn by foot soldiers. The breastplate is decorated with brass accents and fastened to the body through adjustable leather belts that cross the back. Made by Windlass Steelcrafts of 18 gauge steel.